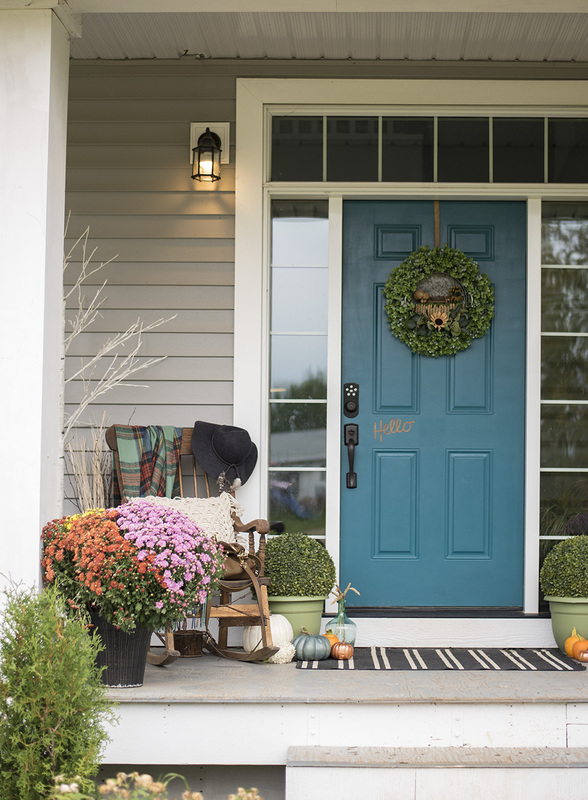 A few simple fall decorating ideas for your front porch from five different bloggers! Today I am joining a few friends in sharing our front porches decorated for fall! 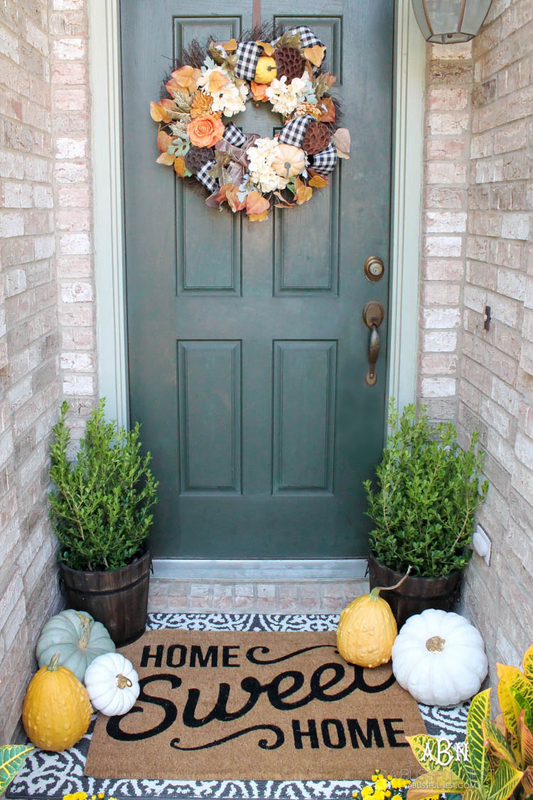 This year, I kept things simple with just a wreath, garland, and a few autumn elements. One of my favorite ways to stretch my decorating budget is to invest in a simple, high-quality garland. Something that isn't trendy, and will last for years to come. I then always place a few real sprigs of greenery into the garland to give it some life. This is very easy to do with Christmas garland! Of course, real would be my first option, but it isn't always easy to find a great, real, garland at a reasonable price or during off season. 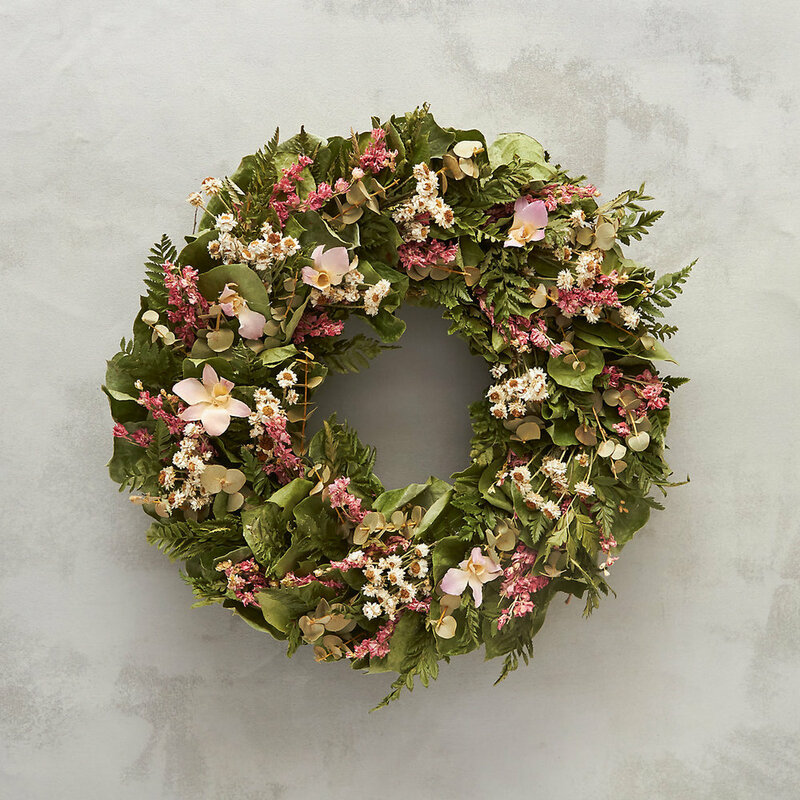 When we got married, we received so many William's Sonoma gift cards, I bought the preserved floral wreath with one of them! It usually hangs in our bedroom, but for autumn, I decided to move it to adorn our new front door. I would have loved to include pumpkins on our porch, but I couldn't find real pumpkins anywhere! I will absolutely be adding a few once they hit the shelves! I love the above photo of Coders and I walking into the house - he follows me wherever I go. He is like my little sidekick, and really, a best friend. Can anyone else relate to having an animal best friend? When we were remodeling, all of the construction guys would say, "he doesn't let you get out of his sight!" It is very true, where I go, he goes, and I wouldn't want it any other way. On another note, I had the chance to stop at Whole Foods on my way home from Tahoe last week. I always take a trip through the floral section whenever I am there. I generally grab a bundle of hydrangeas, lilies, and roses. This time, instead of buying pre-cut hydrangeas, I bought a hydrangea plant for $8 (which was cheaper than the cut stems!). I placed my new plant in an old French crock, and it looks beautiful outside on the porch next to a few candles and preserved pumpkins. PS: I thought you might like to see what our porch looked like before we remodeled! What a difference a new door, windows, and paint makes! 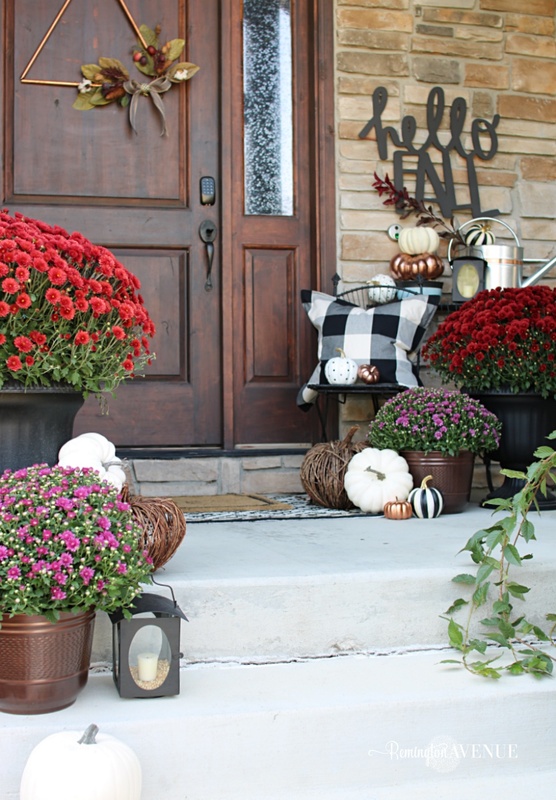 visit my friend's fall front porches! I hope you have enjoyed seeing snippets of our fall home! I love being a part of blog hops because it gives me the opportunity to share some of my talented friends with you! To visit the other porches on this hop, simply click below!